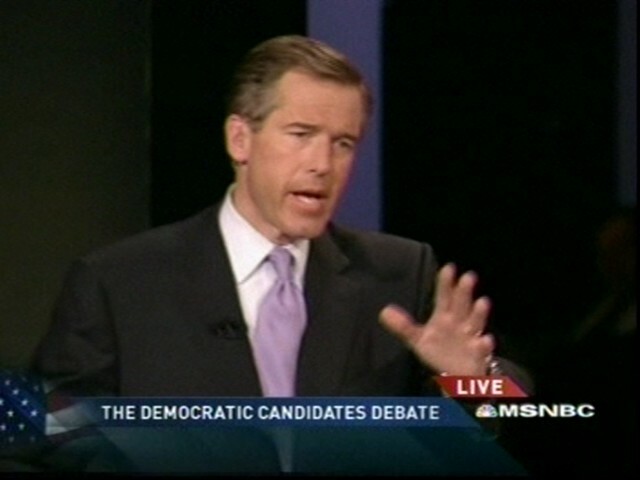 We find some spinning but no whoppers at the first candidate debate of 2008. Eight Democratic candidates debated in South Carolina. We found some minor stumbles. Sen. Barack Obama of Illinois, explaining his call to show compassion for Palestinians, put a spin on the remark that differs from the way it was originally reported by an Iowa newspaper. Sen. Hillary Rodham Clinton of New York said the Virginia Tech killer had been ruled a threat "to others" and involuntarily committed because of his mental state. Neither is true. Obama boasted of taking no money from registered lobbyists but didn’t mention that he does accept money from their family members and partners and from ex-lobbyists. Moderator Brian Williams: You said recently, "No one is suffering more than the Palestinian people." Do you stand by that remark? Obama: Well, keep in mind what the remark actually, if you had the whole thing, said. And what I said is nobody has suffered more than the Palestinian people from the failure of the Palestinian leadership to recognize Israel, to renounce violence, and to get serious about negotiating peace and security for the region. That’s somewhat different from the way Obama was quoted March 12 by reporter Thomas Beaumont of the Des Moines Register. As reported, Obama attributed Palestinian suffering to "the stalled peace efforts with Israel" and not so narrowly to failures by Palestinian leadership only. Des Moines Register, March 12: Obama told the Muscatine-area party activists that he supports relaxing restrictions on aid to the Palestinian people. He said they have suffered the most as a result of stalled peace efforts with Israel. "Nobody is suffering more than the Palestinian people," Obama said while on the final leg of his weekend trip to eastern Iowa. That statement would appear to lay some of the blame at the doorstep of Israel’s leadership as well. However, Beaumont also reported that Obama praised Israel as an important U.S. ally and urged the Palestinian government to recognize Israel and renounce terrorism. So far as we can tell, Beaumont was the only reporter present at the event and no full transcript exists. Hillary Clinton slipped up in her description of the Virginia Tech killings, overstating what a Virginia court had found about the shooter’s mental state in 2005. Clinton: Unfortunately, we saw the tragedy unfold at Virginia Tech. We now know that the background check system didn’t work, because certainly this shooter, as he’s called, had been involuntarily committed as a threat to himself and others. And, yet, he could walk in and buy a gun. That’s only half true. It’s correct that Seung-hui Cho had a court-documented history of mental illness that under federal law should have precluded his purchase of a firearm. And he was indeed found to present "an imminent danger to himself as a result of mental illness" in a ruling dated December 14, 2005, issued by a special justice of the Montgomery County, Virginia, General District Court. But Judge Paul Barnett did not check a box that would have declared Cho “an imminent danger to others." Moreover, the judge declined to involuntarily commit Cho and sent him to outpatient counseling. Clinton’s confusion on this might stem from bad reporting by some news outlets that said Cho was found to be a danger to himself and others. Obama also said he’s taking no money from "federal registered lobbyists," while failing to mention that he does accept funds from their spouses, children and partners, and that several ex-lobbyists are raising money for him. Obama: I have not taken money from federal registered lobbyists. We’re not taking money from PACs. What we are doing is organizing ordinary people to do extraordinary things all across the country. And that’s what it’s going to require in order to change politics in this country. It’s true that Obama hasn’t accepted any money from political action committees. And spokesman Bill Burton told The Associated Press that the campaign has returned $50,566 from 49 donors whom it had identified as lobbyists. Nevertheless, Obama accepts money from lobbyists’ spouses and other family members, their partners at the law firms where they work if the partners aren’t registered to lobby, senior executives at companies that hire lobbyists, and state-level lobbyists. Among his top fundraisers are at least a few who were registered lobbyists as recently as last year, such as Alan Solomont, who says he withdrew his registration as soon as he signed on to raise money for Obama. The campaign says it is making a "best effort" to stay away from tainted money. "It isn’t a perfect solution to the problem and it isn’t even a perfect symbol,” spokesman Burton has said. Elsewhere we noted factual claims that were overly expansive, dubious, unproven or unprovable, but weren’t major howlers. In Iraq for Oil? Rep. Dennis Kucinich of Ohio repeated once again the claim that "we’re in Iraq for oil," something always denied by the Bush administration and hardly supported by the record. In only one month since the invasion has Iraqi oil production risen above its pre-war levels, and production today still lags far behind pre-war output, according to the Brookings Iraq Index. If the U.S. really went in for oil, it has so far gotten less, not more. Teacher Pay: Sen. Joseph Biden of Delaware may have made an overbroad claim about teacher pay. Asked why China, India and Japan have relatively more students than the U.S. pursuing advanced degrees in science and engineering, he said: "In those very nations named, a teacher makes as much as an engineer." Perhaps that’s true, but his campaign couldn’t document it fully. Biden aides pointed to an article by Stanford professor Linda Darling-Hammond from the November 2005 issue of the Phi Delta Kappan magazine, which says, "In Japan, teacher salaries are comparable to those of engineers." But the story makes no mention of China or India. Amnesty for Aliens: At one point it was the questioner who did the spinning. NBC’s Brian Williams asked Clinton if she would "defy the majority of American citizens and offer a form of amnesty for illegal aliens." But "amnesty" is a loaded term used by Republicans to describe what Democrats prefer to call a "path to citizenship" for those in the U.S. without legal permission. And we find no consistent majority on this question in the results of various polls from the last year. A Los Angeles Times/Bloomberg poll in December 2006 found that 44 percent thought Congress "should create [a] guest worker program with [a] path to citizenship," while 46 percent thought they should not. A plurality opposed the Democratic position, but not a majority. In another poll, from the Republican-aligned Winston Group in April 2006, a bare majority of 51 percent opposed a plan to "grant amnesty to illegal immigrants," but even described that way, 43 percent supported it. Veto Math. Obama commented that the country was “one signature away or 16 votes away from ending this war,” a reference to Congress’ passage this week of an Iraq war spending bill that includes a timetable for the withdrawal of troops. President Bush has said he will not sign the bill. The Senate indeed needs 16 more votes to override a veto. But Obama didn’t mention that a two-thirds majority in the House requires 72 more supporters, if all members vote. He would have been correct to say the country is "one signature away or 88 votes away." Worth noting is that New Mexico Gov. Bill Richardson and Kucinich both continued to claim that they could bring health coverage to millions of uninsured without increasing taxes. We’re skeptical. But that’s a highly complex subject that we need to research further. It’s going to be a long, long campaign. Republican candidates hold their first debate May 3. We’ll be watching them, too. Beaumont, Thomas. "Up-close Obama urges compassion in Mideast: He backs loosening of restrictions on Palestinian aid," Des Moines Register. 12 March 2007. Darling-Hammond, Linda. "Teaching as a Profession: Lessons in Teacher Preparation and Professional Development." Phi Delta Kappan 87 (2005): 237-240. “Iraq Index.” 29 March 2007. Brookings Institute. 27 April 2007. “Court Found Cho ‘Mentally Ill’” 19 April 2007. The Smoking Gun. 27 April 2007. Kuhnhenn, Jim. "Obama returns more than $50,000 in lobbyists’ contributions," The Associated Press. 14 April 2007. Bolton, Alexander. "Sen. Obama finesses his lobbyist ties," The Hill. 20 April 2007. Kirkpatrick, David D. and Pilhofer, Aron. "Filings on campaign finances offer glimpses into operations of the candidates," The New York Times. 17 April 2007. Center for Public Opinion Research, University of Connecticut. Survey by New Models and Winston Group, April 8-April 9, 2006. Retrieved April 27, 2007, from the iPOLL Databank, The Roper Center for Public Opinion Research, University of Connecticut.